Hi, I am selling my five-ten maltese falcon clipless biking shoes. These shoes are well used and is ripped a little on the bottom of the shoe. But overall they ride good. I am leaving the United States in the beginning of February and I would like to sell the before. You can contact me by messaging me on PInkbike. Thanks. 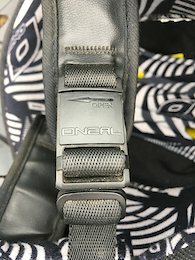 Hi, I am selling my Crank brothers double shot 1 pedals. These pedals are in great condition and have only been used a couple of times. I'm leaving the United States in the beginning of February to visit Peru and I would like to sell them before I leave. You can Text or Message me on Pinkbike. I am trying to sell these pedals before I go to visit Peru on February 4, so if you are interested, please feel free to contact me. Thanks. This is my 2015 Specialized Demo 8, and I am ready to share its extreme joy with someone else. I love this bike. It is just time for an upgrade. I live in Statesville North Carolina, but I visit Peru for a few months out of the year. I am heading back in February, so I am hoping to sell before I leave. If you have any questions, just send me a message here on Pinkbike. Thanks. This is my 2017 ONEAL Fury RL helmet that I bought last year. I am selling because it does not match my bike or jersey and I want a different color. It is in great condition with only a few small scratches in the back. This helmet is a Medium that features a Fidlock closure that I find very handy. I am selling this from NC and can ship within the country. For more pictures or if you have any questions, you can call my number. Yes I live in Peru, but I am from NC and often buy bikes from the States to bring down here. Hi, I am interested in your bike, but I was wondering if you could lower your price to $1350. Also I was wondering if you could send me some more pictures of the bike.